As midnight approaches America’s east coast Hurricane Sandy continues to lash the shoreline with wind, rain and snow. 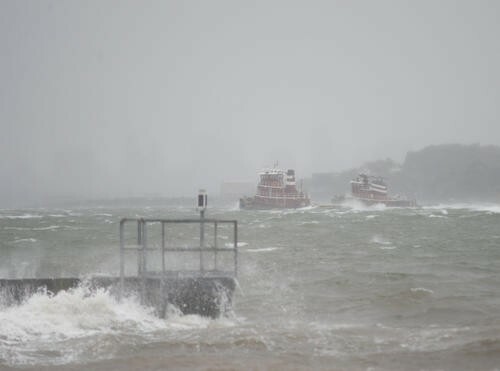 The system came ashore near Atlantic City, New Jersey, at 8 p.m. New York time, and by 9 p.m. the National Hurricane Center said it was receiving reports of hurricane-force wind gusts over Long Island and the New York metropolitan areas. Sandy is no longer a hurricane because it’s drawing energy from temperature differences and not the ocean, making the transition to a superstorm that may push a wall of water ashore in the Northeast. As of 9 p.m. Eastern time, Sandy was 15 miles (24 kilometers) northwest of Atlantic City, moving west-northwest at 21 miles per hour with top sustained winds of 80 mph. It’s forecast to turn north by tomorrow and cross through Pennsylvania to reach New York on Oct. 31, the center said. Rains are soaking the mid-Atlantic states, 3 feet (0.9 meters) of snow may fall in the Appalachians and a record- breaking storm surge may wash over Manhattan’s Battery Park.